The U.S. 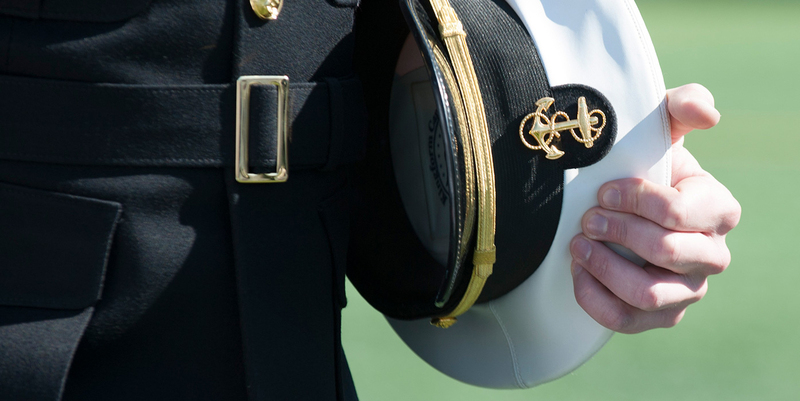 Naval Academy Foundation’s Tribute Gift Programs welcomes gifts in honor of and in memory of Alumni, family and friends at Alumni Hall, Max Bishop Stadium or Navy-Marine Corps Memorial Stadium. Make A Gift Today Online! The Honor Chair Program is a tangible way to remember and honor special individuals at the time of a graduation, anniversary or other special occasion - or just in recognition of that individual. 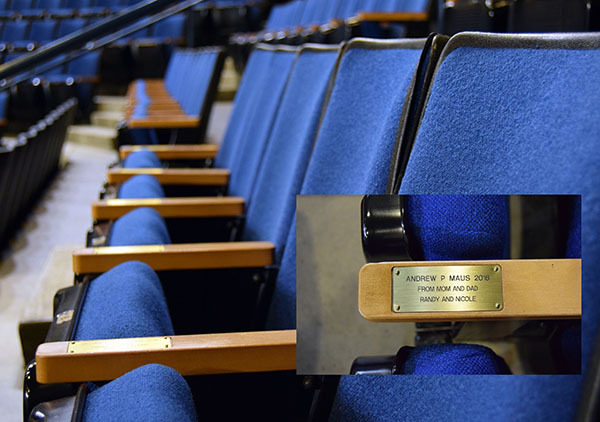 A $1,000 gift to the Naval Academy Fund allows the permanent placement of an engraved brass plate to a seat in Alumni Hall at the Naval Academy. *Please note that matching gifts do not count towards the $1,000 gift for an Honor Chair. With a gift of $1,000 to the Baseball Program Fund, you can honor a classmate, loved one or friend by "taking" a seat in the recently renovated Max Bishop Baseball Stadium. The honoree's name is inscribed on a plate permanently affixed to the seat; each plate permits four lines of text. Participation in the Take-A-Seat program helps to maintain the stadium and ensures that its legacy lives on for generations of graduates. You may name up to five seats in accordance with the amount of your gifts. With a gift of $1,000 to the Navy-Marine Corps Memorial Stadium Maintenance Fund, you can honor a classmate, loved one or friend by "taking" a seat in the recently renovated Navy-Marine Corps Memorial Stadium. The honoree's name is inscribed on a plate permanently affixed to the seat; each plate permits four lines of text. Participation in the Take-A-Seat program helps to maintain the stadium and ensures that its legacy lives on for generations of graduates. You may name up to ten seats in accordance with the amount of your gifts. 3.) 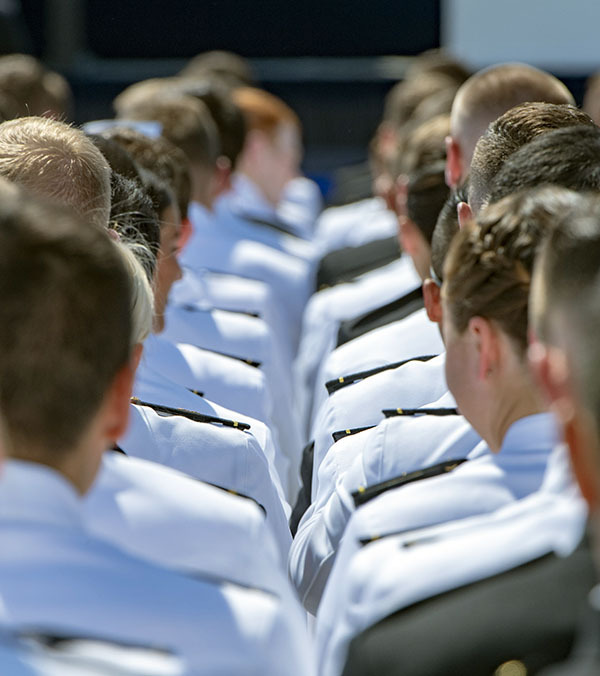 The name of the individual or group to be honored or memorialized with your gift, including the individual’s USNA year of graduation as applicable. This information will allow the Foundation to properly record your gift. If you have any questions, please contact Kellyn Caldwell, Assistant Director of Donor Relations & Stewardship at 410-295-4111 or via email.